Installed in homes throughout the world, central heating systems are almost taken for granted, and their flaws sometimes overlooked. 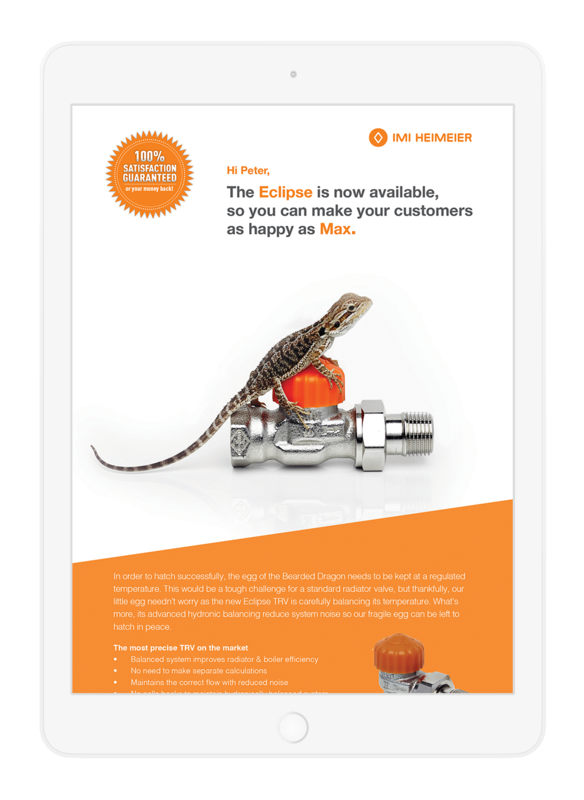 To banish the common issue of temperature fluctuations, IMI – the leading manufacturer of radiator valves in Europe – engineered Eclipse, the world’s smallest automatic thermostatic valve.With an advanced balancing system, it allows perfect temperature regulation, while remaining extremely quiet. 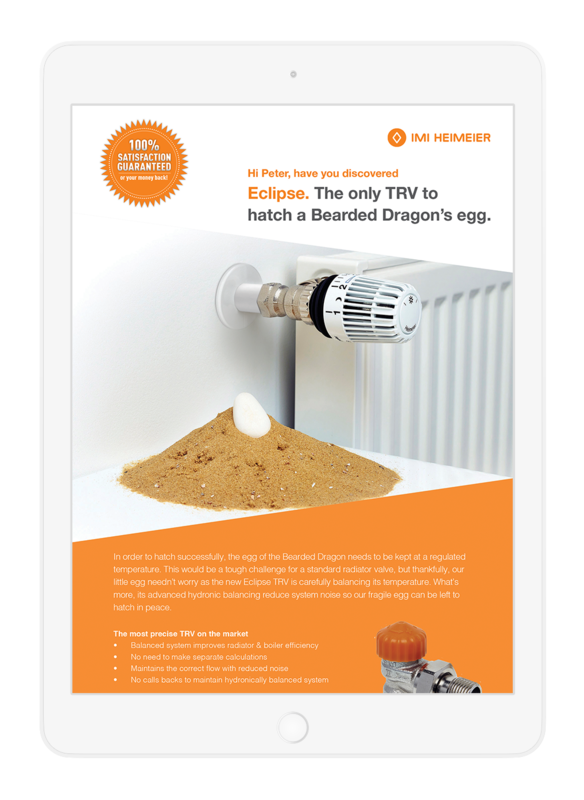 IMI approached SLG to launch the new product in the European trade media, and in homeowner markets in the UK, France, Belgium, Germany, Switzerland and the Netherlands. 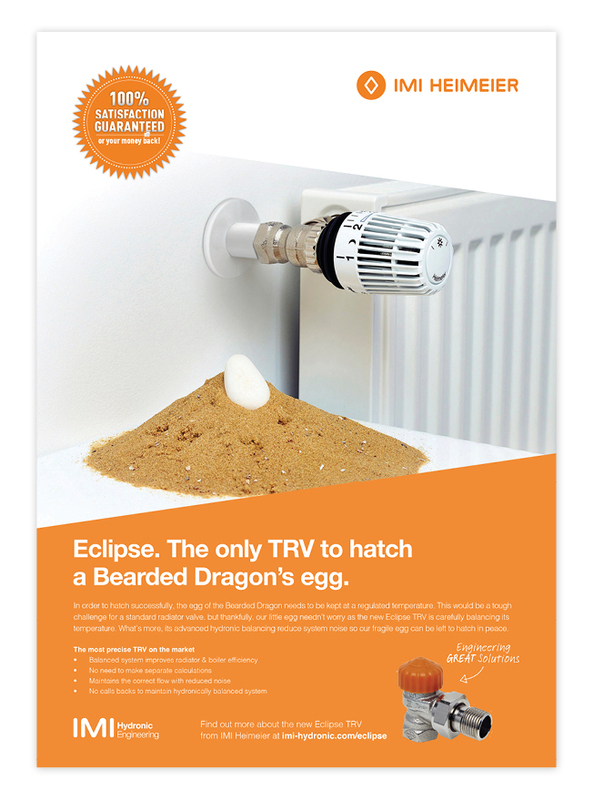 Recognising that homeowners want a radiator system that is easily adjustable, and which provides a consistent temperature throughout their home, we set about finding a striking parallel, something for which a regulated temperature is as important as it is for IMI’s customers.Ultimately, the animal kingdom provided the inspiration we needed –the bearded dragon.Relying on a constant and specific temperature to incubate and hatch its egg, it’s one of the harshest critics of fluctuations in heat, making it the ideal ambassador for the new Eclipse valve range. 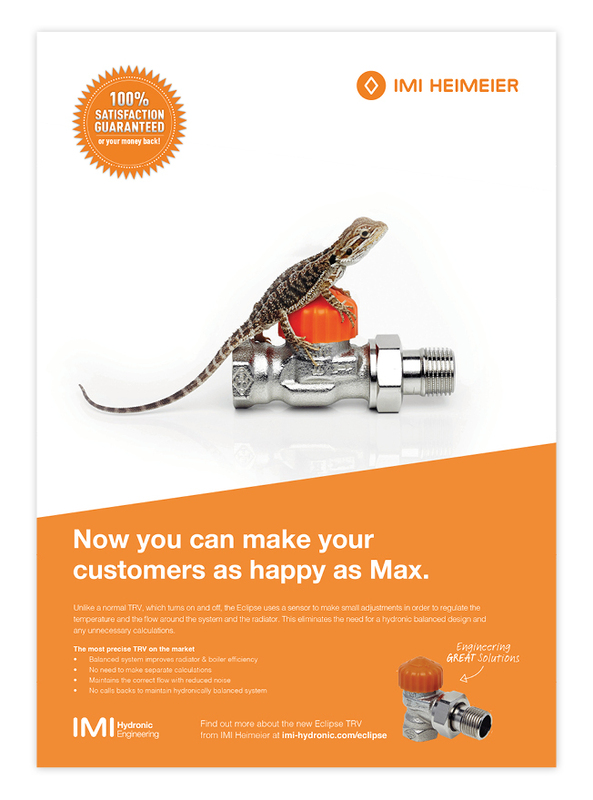 From pre-campaign teaser videos and print advertising to a real bearded dragon display at IMI’s official press launch, our intrepid bearded dragon, Max, was the star of the show. 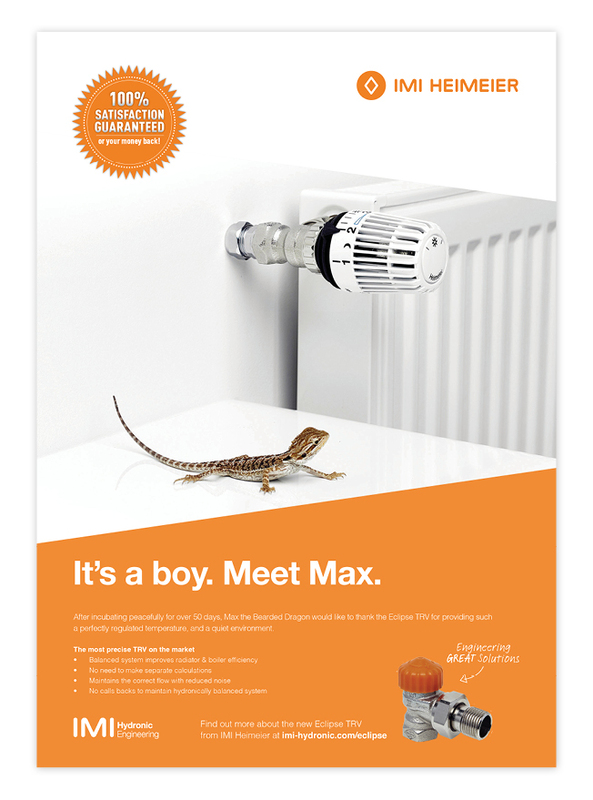 Throughout the launch campaign, Max and his message of controllable warmth, captured the attention of the press and public. 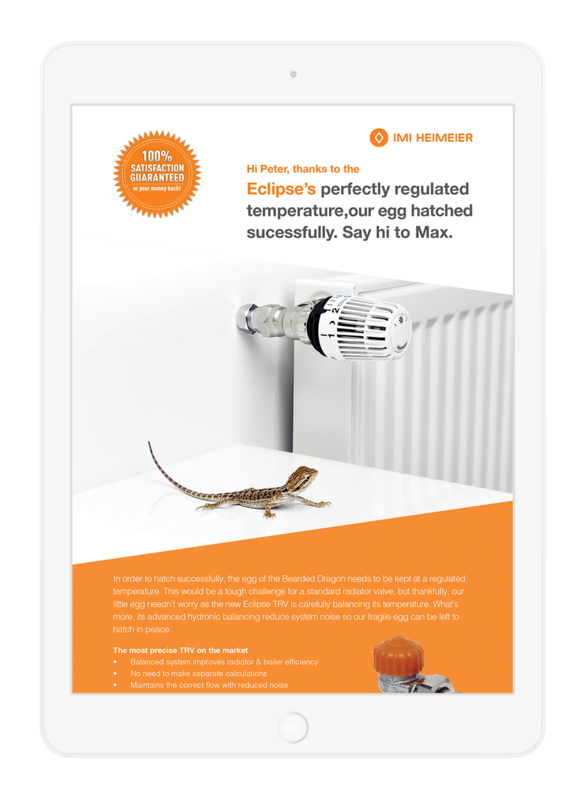 Displayed at an exclusive press event held in Frankfurt Zoo, the Eclipse range generated extensive coverage in trade publications throughout Europe, while sales and customer information requests far exceeded expectations.